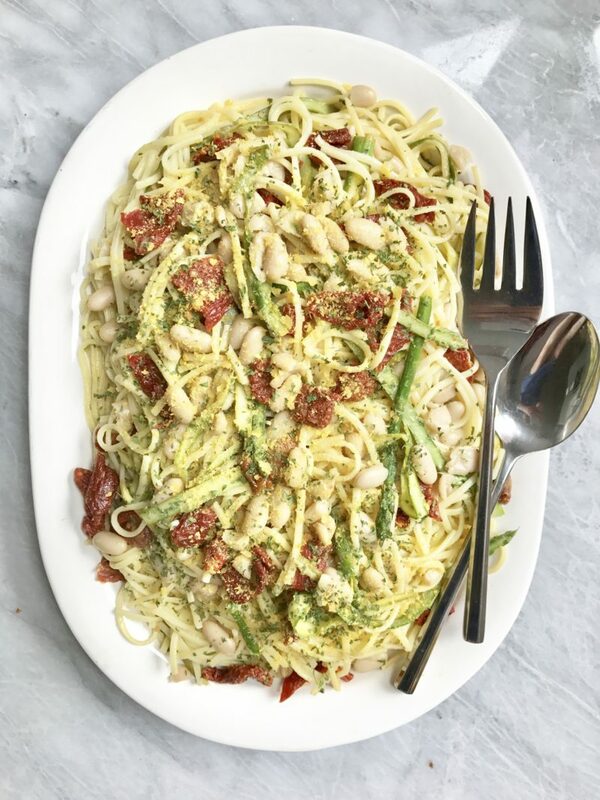 Asparagus is such an amazing produce that is in full force this time of year so I thought, “Why not add it to a recipe?” Especially, one that involves PASTA! There is no doubt that Pasta is a popular dish. You guys request pasta recipes constantly so I thought why not pull one out that also fits this season? 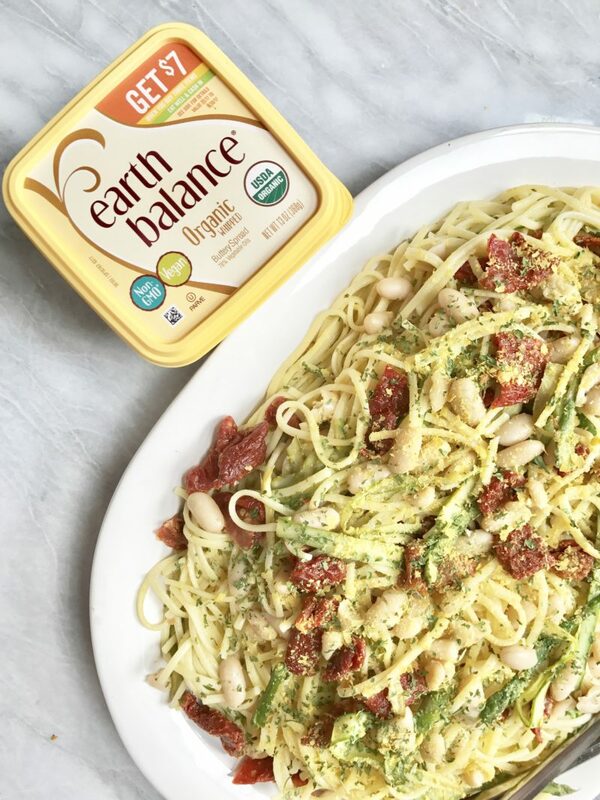 This sauce is creamy, and buttery, thanks to Earth Balance. I have been using their buttery spreads since I first went Vegan because they’re delicious and you can literally put it on everything. All of their products are non-GMO and I use their whipped spread for so many of my dishes. I love to add it to toast, cook my tofu scramble in it, and on lazy nights just throw it on some pasta. They also make a soy free version if you are looking to do this recipe soy free! They also sell a variety of snacks (for example, the white cheddar puts and mac n cheese are my favs)! Butter & lemon is such an awesome combination, which is why I think it does so well on this pasta dish. I decided to use Earth Balance’s Whipped Buttery Spread for this recipe because I think it melts wonderfully and also has a really great taste to it. It’s also super airy and also has an incredible buttery taste to it. It’s versatile, but goes incredibly well in pasta dishes. Their buttery spreads have become a staple in my household and we go through tubs incredibly quick! 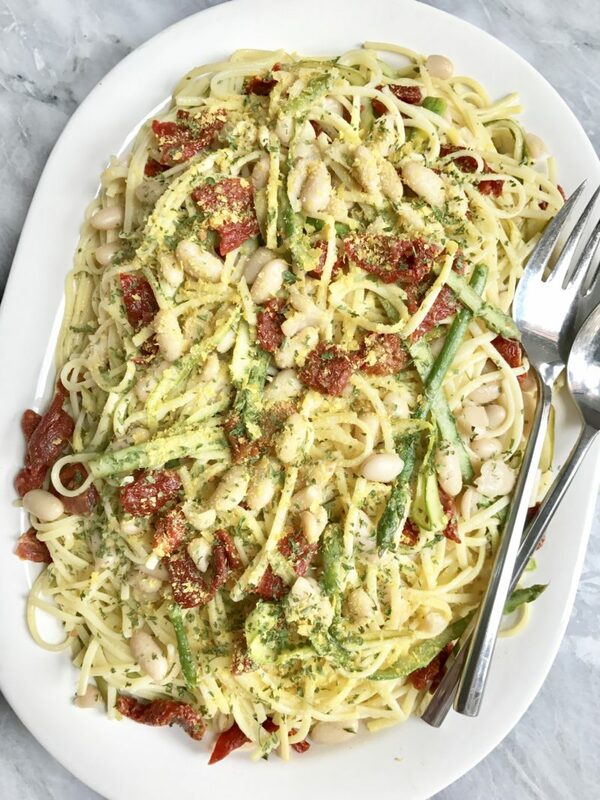 I also love the addition of the sun dried tomato and white beans for this recipe to add some protein as well as intense flavors from the sun dried tomato. It really helps bring out the dish. Add a little nutritional yeast and lemon zest, and you have an amazing pasta dish perfect for the summer time. If you ever make any of my recipes, tag me on Instagram @plantbasedjane so I can see! Begin by washing your asparagus and with a peeler, peel your asparagus so that they turn into thin slices. Meanwhile, bring a large pot of salted water to a boil. At this point, chop your sun dried tomatoes into bite size pieces and wash your beans. After your water is boiling, cook your pasta according to package instructions. When your pasta is done cooking, reserve 1/2 cup of the starchy cooking water. Heat up a large skillet on medium heat. Add a little Earth Balance and cook your asparagus until tender. Add your beans, sun dried tomatoes, and drained pasta into the skillet. Bring heat to low and add in your Earth Balance, pasta water, nutritional yeast, salt, pepper, lemon juice & zest and mix until combined. Transfer your pasta onto a dish and garnish with the dried parsley. 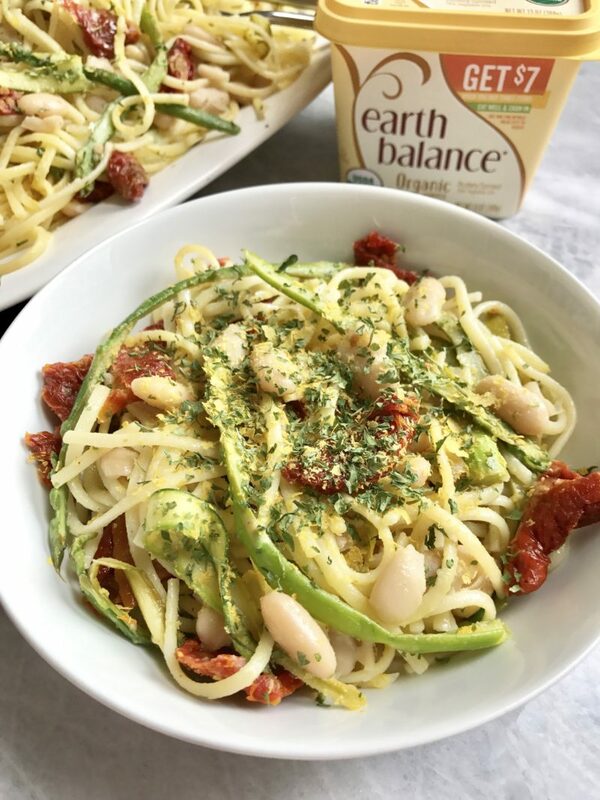 Thank you Earth Balance for sponsoring this post! It means a lot to me to work with brands that I love and support PlantBasedJane. Get updates on my recipes, lifestyle posts, etc.